Why Did INV*30 DAY DIVIDENDS Show up on My Credit Card Bill? Why is INV*30 DAY DIVIDENDS showing up on my credit card statement? If your credit card statement reflects a recent charge from INV*30 DAY DIVIDENDS, it signifies that you have recently signed up to receive the financial newsletter 30 Day Dividends published by Investors Alley. • What is 30 Day Dividends? 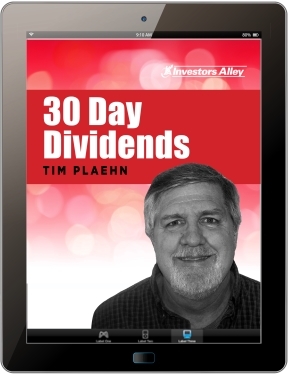 Written by Tim Plaehn, 30 Day Dividends is designed to provide you with a new and innovative approach to profits from dividend investments. With each issue, Tim Plaehn uses his unique cash flow analyzer system to bring you in-depth research on dividend investments for not only high yield but dividend growth as well. 30 Day Dividends seeks to reward investors with steady income and quick share price appreciation in certain classes of income producing stocks. This new service from Tim Plaehn, known for his work with The Dividend Hunter, employs a strategy of event-based investing and accurate prediction of market sentiment toward a clearly defined set of stocks. The objective is to deliver quick gains from larger than usual dividends, special dividend payouts, capital appreciation, and time sensitive opportunities with income investments. As a former F-16 fighter pilot, stock broker, and Certified Financial Planner, Tim has years of experience identifying the best investments available and performing at the highest level. And, he shares that knowledge with you — in plain English — in every exciting monthly issue of 30 Day Dividends. • Why don’t I recall ordering INV*30 DAY DIVIDENDS? It is possible that you signed up for a trial subscription for 30 Day Dividends without recalling it after reading our report on “Primary Dividends” or took advantage of the special discounted $79 offer that comes after you sign up for Tim’s other service, The Dividend Hunter. • How can I cancel 30 Day Dividends? 1) Visit Investors Alley’s customer service website for 30 Day Dividends by clicking here now or putting http://www.investorsalley.com/contact/ in the address bar at the top of your browser. 2) Or contact 30 Day Dividends by calling 1-(855) 566-6100. The customer service toll-free number is open from 9:30 a.m. to 4:30 p.m. M-F Eastern Time and will only work for U.S. and Canadian subscribers. To learn more about the 30 Day Dividends newsletter and our other publications, click here. If you want to find out how subscribers of 30 Day Dividends are closing out 75% of their trades as wins, Click Here.